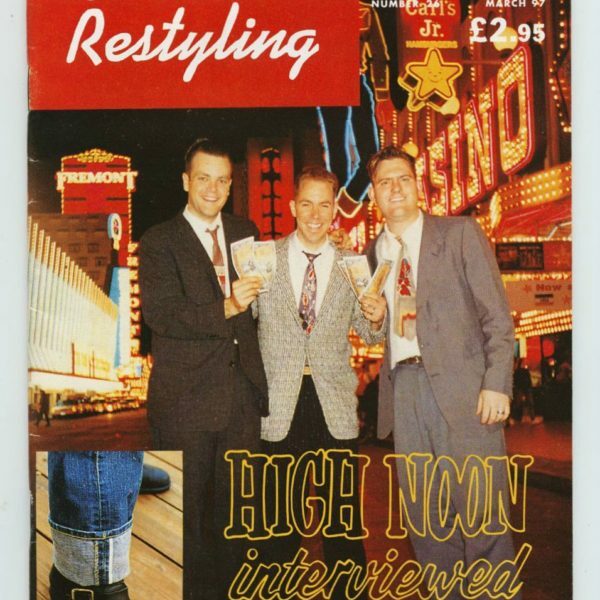 Following Jesse’s great post last week on selvedge denim, I thought I’d share some scans from an old 1997 issue of Continental Restyling – an important lifestyle magazine for the Hepcat scene from 1993 until 2000. 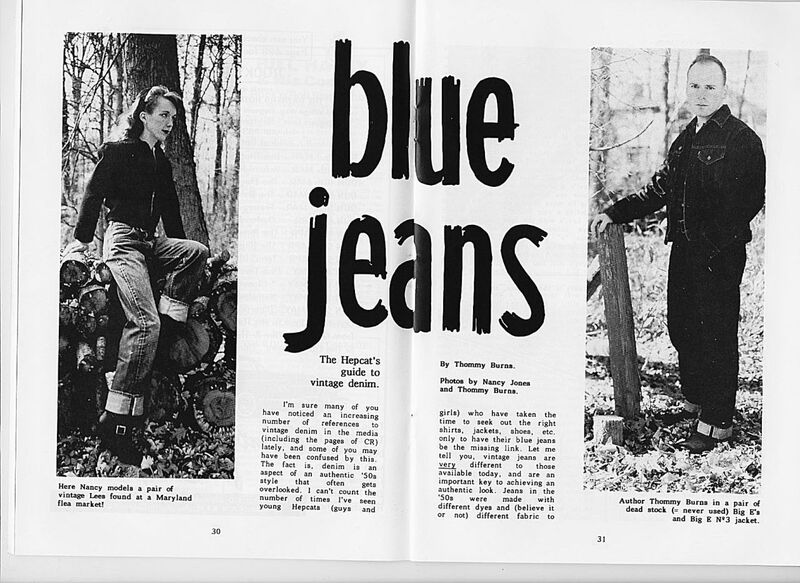 This was a publication for people passionate about 1950s American culture, rockabilly music, and a certain style of vintage clothes (e.g. circle skirts, rock’n’roll shirts, Hawaiian shirts, and blue jeans). 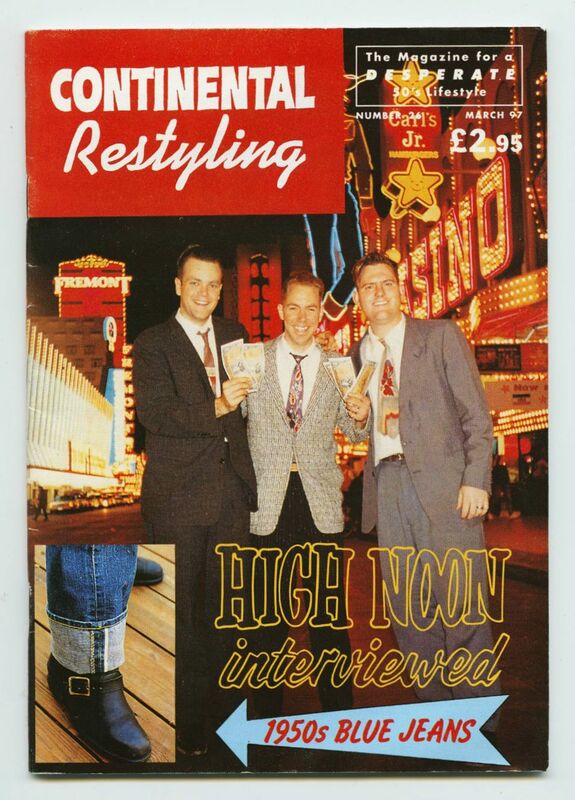 In this issue (now almost 20 years old, if you can believe), we see what the selvedge stripe used to mean to a certain group of vintage clothing enthusiasts. I can’t count the number of times I’ve seen young Hepcats (guys and girls) who have taken the time to seek out the right shirts, jackets, shoes, etc. 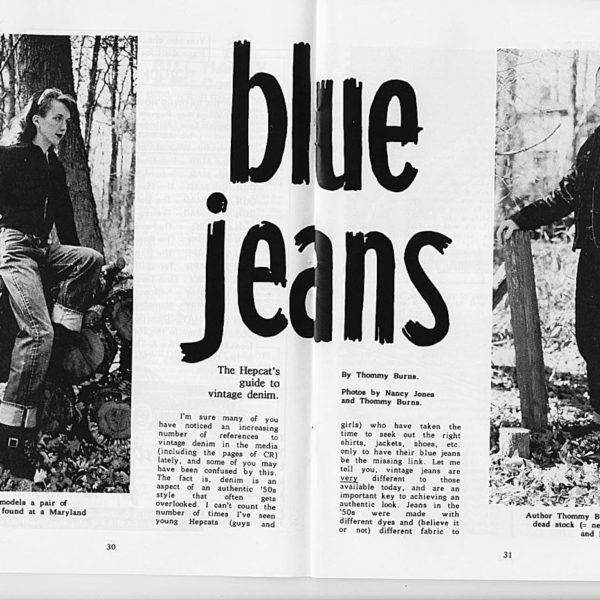 only to have their blue jeans be the missing link. Let me tell you, vintage jeans are very different to those available today and are an important key to achieving an authentic look. Jeans in the ‘50s were made with different dyes (believe it or not) and different fabric to those today – they look different when new and the differences become more apparent when they’re worn in. Levi’s are my personal favourites. They have always been the world’s most popular jeans and therefore more Cats wore them in the ‘50s, it just stands to reason. Vintage Levi’s have a beautiful ultra-dark indigo colour that gets a distinct and attractive “streaky” grain as it fades. 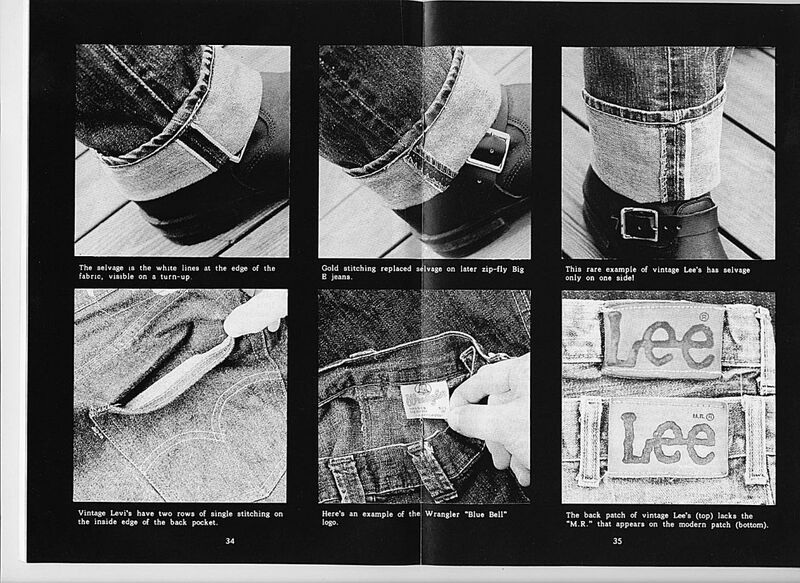 Another important facet of vintage Levi’s is the selvedge edge the fabric, visible on a turn up. This is a finished white edge inside the pants, on the outer seam. 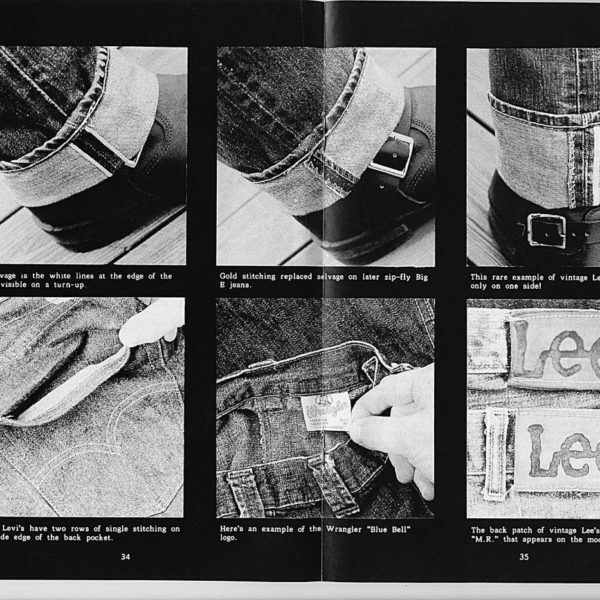 […] All Levi’s made up to the 1960s had selvedge, this makes it an integral part of an authentic ‘50s look. Jesse’s right when he says that turning up your cuffs to show the little selvedge stripe means “I care.” This was true for vintage clothing enthusiasts in Japan in the ‘80s and it’s true for denim enthusiasts today. It used to mean other things as well, however. It used to mean not only that the denim was woven on narrower shuttle looms, but also something specific about what kind of dyes were used, how the yarns were dyed, and how the resulting jeans were finished. In other words, people cared about that little selvedge stripe because it meant something about how the jeans would fade (sound familiar?). It was an indication of a greater set of production choices, originally made in the mid-century by companies such as Levi’s and Lee. Today, companies can produce selvedge denim in ways that was never done in the early- to mid-century. Generally speaking, the presence of that little stripe still means that the jeans are meant to fade a certain way, but exactly how those jeans fade is a lot more variable. The connection between selvedge and the broader picture of production methods has evolved a lot over time. There are dozens of companies now offering selvedge denim. Some even offer “fake selvedge jeans,” where a strip of selvedge is sewn onto the bottom of the cuffs, so they can be flipped up and made to look fashionable. So what’s the difference between one pair of jeans and another? As Jesse noted, everything. Selvedge denim jeans are defined not just by that little stripe, but also what kind of cotton was used, how that cotton was spun into yarn, how those yarns were dyed, how those dyed yarns were woven into denim, how that denim was made into jeans, and how those resulting jeans were treated in the “finishing” process. All those aspects will determine how a pair of jeans will fade and age over time, and it’s for this quality why some people will choose one pair over another. Which for me, says something about how we view clothes. 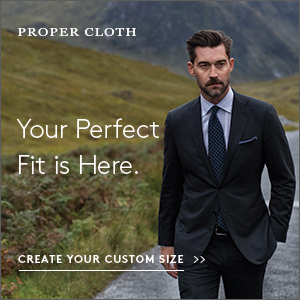 Presumably, we got to this place because people reduced jeans to just that little stripe – whether because they equated selvedge with quality, or because they heard selvedge stripes were fashionable right now. This gave companies more of an incentive to produce. As Jesse mentioned, you can buy selvedge denim nowadays for $40 from Converse, $89 from The Gap, or $350 from The Flat Head. In some ways, I think this is great, as not everyone can (or wants to) spend a lot of money on jeans, and it’s good to have options. On the other hand, it’s useful to remember there’s no “one thing” that will ever tell you the whole story about a garment. 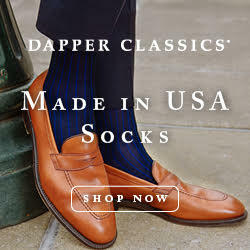 That “thing” can include country-of-origin labels, care tags that say 100% cashmere, stitches that look to be hand sewn, buttonholes that are working on sleeves, and little colored stripes on jeans. 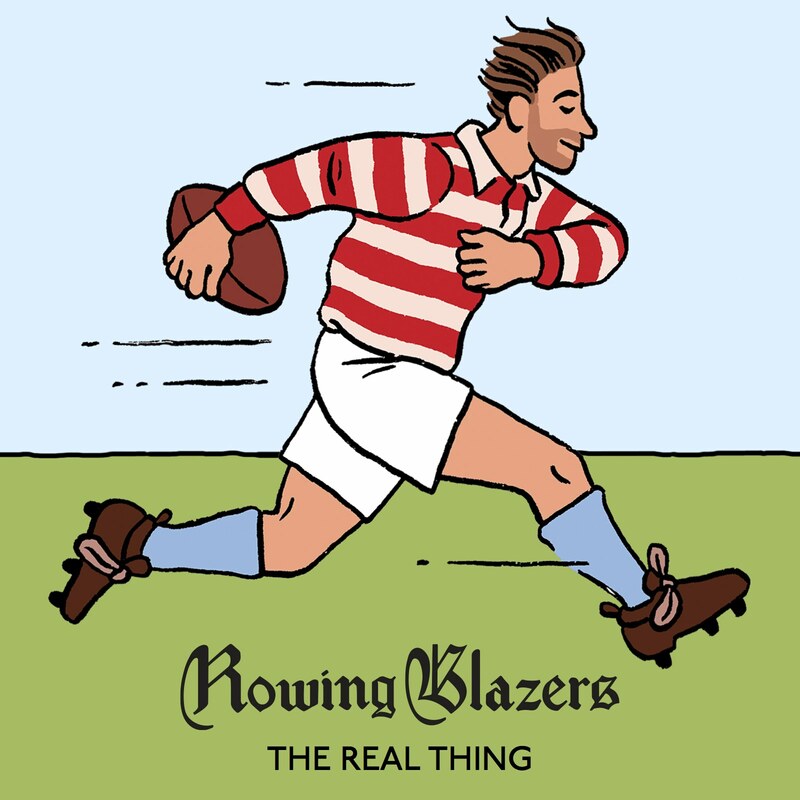 Clothing production is much more complicated than what those things reveal. 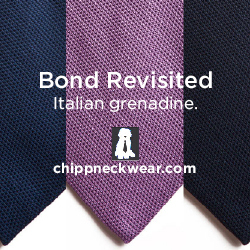 When deciding what to purchase, think about the bigger picture of how something was made and don’t rely on just one detail.